A perfect party starter, these salmon fritters are coated with batter and deep fried until crisp and golden brown. They are best eaten fresh out of the oil while they're still hot and crisp. I have substituted a few ingredients as I don't happen to have them on hand. Please do visit I Just Love My Apron for the authentic and original recipe. Beat eggs, milk, fish sauce and lime juice in a mixing bowl until everything is incorporated. In another bowl, whisk together the flour, baking powder, white pepper, red curry powder and lime zest. Add the flour mixture into the egg mixture. Stir until just incorporated. Add in drained green peas, tinned and fresh salmons to the batter. Stir until well combined. Add oil to a saucepan and heat it up to 190C/375F. Line a baking tray with paper. Preheat your oven to 100C/210F. Drop by tablespoon into hot deep oil. Don't overcrowd. Once they are nicely brown, remove from the pan and keep warm in the oven and repeat the process until you have finished the batter. Sprinkle the fried fritters with salt and cayenne pepper. Use same oil to fry fresh celery leaves until crispy. Place the fritters on a platter and top with celery leaves. Serve salmon fritters hot accompanied with preferred yogurt dressing. This cinnamon bread, also knows as “Bread Kringel”, has been baked for hundreds of years in Estonia, for holidays, birthdays celebrations and special occasions. It originated in Germany and is basically a sweet enriched bread that’s twisted into the shape of a pretzel or a simple ring. Place milk, egg yolk, walnut oil and maple syrup in the pan of your bread machine. Add in flours and the dried yeast. Select the “Dough” cycle, and press “Start”. Mix together the cooled butter, sugar and cinnamon powder in a bowl. When the “Dough” cycle is finished, transfer the dough onto a lightly floured work surface and knead it briefly. Divide the dough in half. Using a rolling pin, roll each out into a 1cm thick rectangle. Spread the 1/3 cinnamon butter mixture evenly over the dough, leaving a 1cm border. Roll dough up, starting lengthwise to form a Swiss roll. Seal edges well by pinching close and slice it in half lengthwise, leaving 5cm intact. Turn each half cut-side up and carefully plait the halves together, keep the cut-side up to expose the filling. Join both ends to form a round wreath and transfer to a baking tray lined with parchment paper. Brush the bread top with the remaining cinnamon mixture. Scatter the silvered almonds over if used. Preheat the oven to 190C/375F. Bake for about 20 minutes or until golden brown. Dust with powdered sugar if desired. Those buttery cookies, which are rolled in poppy seeds and filled with homemade lemon curd or with your favourite jam., are perfect for the holidays. You can replace poppy seeds with finely chopped nuts or coconut shreds. Thoroughly delicious and a welcome addition to any cookie tray. Whisk the eggs and sugar in a saucepan until smooth, then place pan over a low heat. Add the butter, lemon juice and zest and whisk continuously until thickened. Strain through a sieve into a sterilised jar. Lemon curd keeps, covered, in the fridge for 2 weeks. In a mixing bowl, whisk together the flour, salt and lemon zest. Cream the butter and sugar until light and fluffy with a hand mixer. Add egg yolk and lemon extract. Beat until combined. Sift the flour mixture into the creamed butter mixture and mix until the dough starts to come together. Dump on a floured board and roll together into a flat disk. Wrap in plastic and chill for 30 minutes. Preheat the oven to 180C/350F. Line a large baking tray with parchment paper. Roll the dough into 1-inch balls and lightly roll it in poppy seeds. Place on the prepared baking tray and press a light indentation into the top of each with your finger. Drop 1/2 teaspoon of lemon curd into each indentation. Bake for 15-18 minutes until lightly browned. Remove from the oven and place on a wire rack to cool. A really simple pasta dish with crunchy bitter radicchio, that’s balanced by the rich, earthy taste of roasted hazelnuts and luscious, fresh cream. Some chopped roasted nuts would be a nice addition sprinkled on top. Serve with some garlic bread for a complete meal. Cook the reginette in in a large saucepan of rapidly boiling salted water until al dente, about 9 minutes. In the meantime, toast the ground hazelnut in a small skillet over medium-high heat for a couple of minutes, stirring constantly. Lower heat, then add the butter, stir until melted, then add the cream and brandy. Stir to combine, and cook until thickened, 5 minutes. Taste and season with salt and pepper. To serve, pile some radicchio into the bottom of a rimmed soup bowl, then top with reginette. Spoon the sauce over the top. Serve immediately. Those dinner rolls, made from egg white enriched rye dough, have a really shiny and beautiful crust, partly because of overnight proofing in the fridge, partly due to the egg white wash applied prior to baking at high temperature with steam. Dissolve the fresh yeast in the water. Stir in bread and rye flours until well combined. Cover and leave it at room temperature for 2 hours, then transfer to the fridge for 12 hours. Place all the dough ingredients together with starter in the mixing bowl of your stand mixer. Stir at low speed until all ingredients have been incorporated, then increase the speed and mix until the dough gathers into a ball. Add more water, a tablespoon at a time, if too stiff. Cover with a plastic and set aside until it doubles in size, 1-2 hours. Turn out the dough onto a lightly floured work surface. Lightly press down the dough and shape into a round. 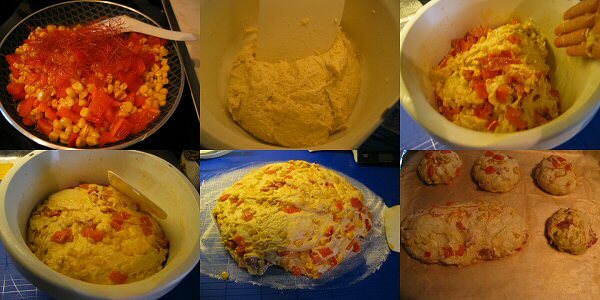 Divide the dough into 10-15 pieces. Shape each piece of dough into a round or an oval. Place them on a baking sheet lined with parchment paper. Cover and proof until double in bulk. This will take about 90 minutes. Preheat oven to 230C/450F and place an old baking pan on the bottom rack. Combine egg white and water in a bowl. Brush the top of bread rolls with egg wash and sprinkle with the poppy seeds. Slash a 1/4-inch/5-mm deep cut across the top of each roll. Place rolls in the oven on the next shelf up, pour 1 cup of water into the old baking pan and close the door quickly. Bake for about 20 minutes until richly brown. Those bread rolls, known in Germany as Brötchen, are crunchy, richly golden brown rolls with a soft interior, and flavourful thanks to an overnight sponge. Serve them warm with jam or/and butter for the breakfast or with a bowl of piping hot soup as dinner. You can always freeze them and re-crisp in the 150C/300F oven. Combine together the flour, water and yeast in a mixing bowl. Cover and leave the starter at room temperature for 16-20 hours. Whisk together the water and fresh yeast in the bowl of your stand mixer. Add in the rest of ingredients together with the sponge. Mix until a soft, smooth dough forms. Shape the dough into a ball and return it to the mixing bowl. Sprinkle a bit of flour over the top of dough. This will keep the dough from sticking. Cover with a plastic and set aside for 90 minutes to rise. When the dough has doubled in bulk, turn it out on a lightly floured work surface. Lightly press down the dough and shape into a long roll. Cut the roll into 12 - 15 pieces. Take each piece of dough and form into a round or oval shaped roll. Place rolls on the baking sheets lined with parchment paper. Cover and let rise until double, about an hour. Preheat oven to 230C/450F and place an old baking pan on the bottom rack. Slash a 1/4-inch/5-mm deep cut across the top of each roll. Place rolls in the oven on the next shelf up, pour 1 cup of water into the old baking pan and close the door quickly. Turn oven down to 220C/425F and bake for 20-25 minutes until they're richly brown. Remove them from the oven, and cool on a wire rack. Vanillekipferl are simply sugar cookies in the shape of crescents that are traditionally as a part of the typical Christmas baking in Austria, Hungary and Germany, but can be enjoyed all year round.They usually contain ground nuts, mostly almonds and hazelnuts, flavoured with vanilla, and often served dusted with confectioners’ sugar. Sift the flour into a large mixing bowl. Add in butter, sugar, egg yolks, and ground almonds. Mix until the dough has become smooth. Form the dough into a ball and wrap well with a cling film. Chill for one hour. Preheat the oven to 180C/350F. Line two baking trays with parchment paper. Divide the dough into 80 pieces. Shape each one into a rope, approximately 7mm thick, and bend into a crescent. Place the kipferl on a baking trays, and bake for 10-12 minutes until lightly golden. Mix the powdered sugar together with the vanilla sugar. Roll the crescents in this mixture while they are still hot. Unlike many other cornbread recipes, this one uses yeast as the leavening agent other than baking soda and baking powder, so the texture is different from the cakey quick bread. This cornbread has a crispy cheesy crust and a flavourful, moist interior, which is generously studded with sweet corn kernels, capsicum, chilli threads, and paprika salami. Measure the cornmeal into a large bowl. Pour in hot water and leave it to soak for about 20 minutes. Prepare two baking sheets with parchment paper. Heat olive oil in a skillet until hot. Add in sweet corn and red capsicum. Stir briefly, and add in chilli threads. Cook until softened. Season with black pepper. Remove and leave it to cool until ready to use. Place water, fresh yeast, cornmeal mixture and flour in the bowl of a table mixer fitted with a dough hook. Stir at slow speed for 3 minutes, then increase the speed and mix for another 3 minutes. Cover the dough in the bowl and leave it to rest for 10 minutes. Now add in the corn capsicum mixture and paprika salami. Use your hand to mix them evenly into the dough. Cover again and rest for 20 minutes. Preheat the oven to 220C/430F. Divide the dough into 3 large portions for loaves or 12 small portions for smaller buns. Shape each small portion of dough into a round. Place Cheddar in a heatproof bowl. Put over a saucepan of simmering water and heat, stirring constantly, until the cheese melts. Spread melted cheese all over the surface of bread and sprinkle cornmeal over the dough and lightly press in with your hands. 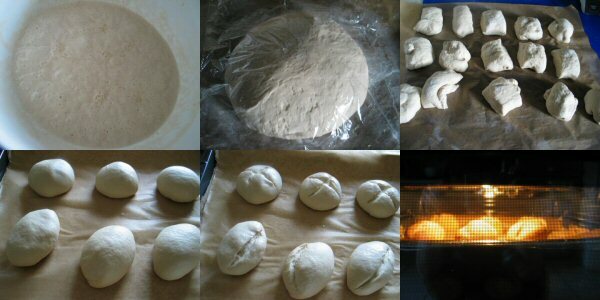 Bake buns for 15 minutes at 220C/430F, then reduce the oven temperature to200C/400F and bake another 20-25 minutes.